OK, it's unlikely you're going to make like Thoreau and move to the woods. Heck, you probably don't even have time for a walk in the woods. If that's the case, though, that may very well mean that it's time to simplify your life. In so doing, you may just save your health -- and your sanity (not to mention actually having time to take that walk). Erin Bocherer and her husband are doing just that. "Our New Year's resolution was to simplify our life as much as possible to reduce stress," says Bocherer, an advertising account supervisor. Online banking. "This limits post office drop-offs and reduces the time and money spent on stamps and licking envelopes," says Bocherer. "It also enables me to schedule automatic payments each month, which saves several hours of our time because we no longer need to write out bills and balance the checkbook." Hiring a cleaning service every three weeks. "We still clean, but they handle the nitty-gritty, time-consuming activities that seemed to fill our weekends," says Bocherer. Hiring a nanny. Yes, this is expensive, but it saves the Bocherers two hours a day in the car dropping off and picking up their son at daycare. "It enables me to spend more quality time with my son (and with my daughter when she is born in May)," says Bocherer. Reducing debt. "Debt is one of our biggest stresses that never seems to end," says Bocherer. By creating a strict, yet manageable budget, and focusing on paying off their debt, the Bocherers say they are creating a feeling of accomplishment. The Bocherers are not alone in their efforts to cut the stress from their life. Browse your favorite newsstand or bookstore and you'll see evidence of an anti-stress movement taking hold in this country. Generally known as "voluntary simplicity," or the "simplicity movement," the need many of us see for a less stressful, more meaningful life is reflected in magazines, books, and web sites devoted to simplifying your life, whether that means "de-cluttering" your home, "downsizing" your career ambitions, or living off the land. About 5% to 7% of adults in the U.S. are pursuing some form of voluntary simplicity, according to Gerald Celente, director of the Trends Research Institute in New York. The contemporary voluntary simplicity movement began in 1981 with the publication of Duane Elgin's book, Voluntary Simplicity: Toward a Way of Life That is Outwardly Simple, Inwardly Rich. Since then, dozens of books, national magazines, web sites, and grassroots "simplicity circles" have sprung up to offer support and share ideas for those interested in scaling back. Simplifying your life doesn't necessarily mean doing without. It might, but it doesn't have to. Rather, the prevailing philosophy of today's voluntary simplicity movement is not to live without possessions or to live in frugality, but to slow down and live a more balanced, deliberate, and thoughtful life. And as research increasingly shows, a healthier life as well. It's no longer news that stress can take its toll on both your physical and mental health. Numerous studies have shown a link between stress and high blood pressure. In one such study, for example, scientists at the University of California at Irvine reported in 1998 in the Journal of Psychosomatic Medicine that men with highly stressful jobs had systolic and diastolic blood pressure readings that were approximately 10 points higher than those with less stressful jobs. In a study published in 2000 in the journal Social Science & Medicine, researchers from Ohio State University and the University of Alabama found that people with a high ratio of credit card debt to income were in worse physical health than those with less debt. 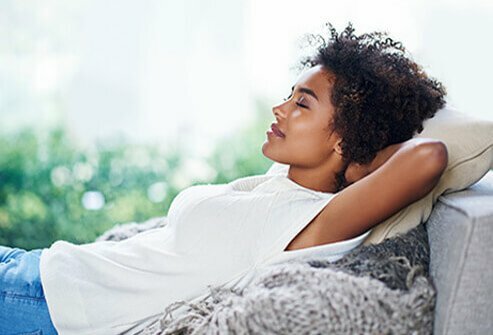 And now, mental health professionals have joined the movement, focusing on how simple living can help alleviate tension-related reactions such as insomnia, nervousness, anxiety, neck and shoulder spasms, chronic fatigue and, says Roderic Gorney, MD, PhD, "our excessive dwelling on 'things.'" "The message that we get is that without this complexity of 'things' in our life, we are not lovable and not worthy," says Gorney, clinical professor of psychiatry at UCLA and author of The Human Agenda, who also serves on the board of Seeds of Simplicity, an LA-based program of Cornell University's Center for Religion, Ethics & Social Policy. The organization has recently started a campaign called "Unstuffocate," to help people decide for themselves just how much is enough. The mental health community's awareness of such dependencies as "consumption addictions" led UCLA's Neuropsychiatric Institute to recently sponsor a conference on "Mental Health and Simple Living: Countering the Compulsion to Consume." The purpose of the conference, says Gorney, was to "help the person shake off the addiction to too much, and with it the distress of excess." Just acknowledging that you need to simplify your life, however, doesn't solve the problem, although it is a beginning. You may be so crunched for time and energy that you can't even stop to think of ways to simplify your life. Let the experts give you a few suggestions. "Many people feel stressed and overwhelmed because they are 'overconnected,'" says Debra A. Dinnoncenzo, president of ALLearnatives, which specializes in alternative work arrangements. "As a result of the ... never-ending ways that people can access us any time of the day or night, we feel perpetually connected to our work," says Dinnoncenzo, also the author of Dot Calm: The Search for Sanity in a Wired World. Turn off your cell phone when you shouldn't be (or don't want to be) interrupted. Don't take a cell phone to an appointment or when you are focusing on someone else. Don't give out your cell phone number. Use it only for outgoing calls. Screen calls by using caller ID. Use the "delete" option -- early and often. Arrange for calls from the office only in cases of emergency. Maintain your commitment to work-free vacations. Let voice mail or the answering machine take your calls. On your voice mail greeting, be clear about when you will and will not be available. Along with all this technology -- which includes the TV too, by the way -- comes information overload, says Daphne Stevens, PhD, a psychotherapist, life coach and author of the forthcoming book, Watercolor Bedroom: Creating a Soulful Midlife. "Limit the amount of information you expose yourself to," she says. "Being flooded with stimuli is a tremendous source of stress." Debbie Mandel, MA, a stress management expert and author of Turn On Your Inner Light: Fitness for Body, Mind and Soul, says simplifying your life is like "spring cleaning for the soul." Make a list of your activities, prioritize your to-do list, and shed those activities that no longer serve a purpose in your life. Delegate chores at home and at the office. Don't try to do it all. Ask for help. Let go of the myth of perfection. Simplifying your life may also mean more than just getting rid of "stuff." It may mean getting rid of people too, says Daphne Stevens. "Avoid overexposure to negative or toxic people," she suggests. Instead, "nurture the relationships that support you. A quick email or card saying 'I'm thinking of you' can work wonders in keeping a friendship alive when we're too busy to do much else." However you choose to simplify your life, remember that simplicity is not about poverty or deprivation, according to The Simple Living Network. It is about discovering what is "enough in your life -- based upon thoughtful analysis of your lifestyle and values -- and discarding the rest." Originally published March 29, 2004. Medically updated June 14, 2005. SOURCES: Erin Bocherer, account supervisor, SBC Advertising. Debra A. Dinnoncenzo, president, ALLearnatives. Debbie Mandel. Daphne Stevens, PhD, Trends Research Institute. The Simple Living Network. Roderic Gorney, MD, PhD, clinical professor of psychiatry, UCLA. What is happiness? What is the happiest country? What neurotransmitters do the body use to increase good feeling? Are we hardwired for misery, or does lifelong bliss require a gratitude attitude? Grieving? Whatever your method of dealing with grief, it’s perfectly normal. Take the Grief, Bereavement, and Mourning Quiz to learn all about the grieving process.